Omnisend has been collaborating with Organic Aromas and has just completed a four-week experiment in building a contact list. With only an hour invested (and zero financial input), this online store captured 661 new leads and ended up with 40 extra orders. Four different Omnisend signup forms were involved in this experiment for one week each. We found that circumstances when the pop up appears, matter. Let’s find out which one has performed better. By the way, if you haven’t yet, be sure to read our in-depth article discussing how to build an email list from scratch (covering 9 proven tactics). It’s worth mentioning that the experiment took place as part of the Omnisend Email Lab framework. This aims to approach the client and take a closer look at their individual needs. Organic Aromas applied to participate in the Omnisend Email Lab, in particular, to attempt building its email lists. As you may already know, email list building is a complex issue faced by the vast majority of online retailers. It involves signup form optimization, capturing new leads as well as contact list health. Keeping a list healthy means that you should be proactive in removing bots, inactive subscribers, etc. from your lists. This is important for your email campaign results – open and click rates. In addition, keeping only active users in your email list helps you decrease costs on email service providers which charge you for all of the subscribers that you have. So you’d better have them all active and engaged with your brand. In the case of Organic Aromas, we identified that more than 30% of email addresses in the contact list were ineffective. By removing them, this merchant will save $20 per month. Over time, the amount of money saved will grow along with the increase in the number of subscribers. 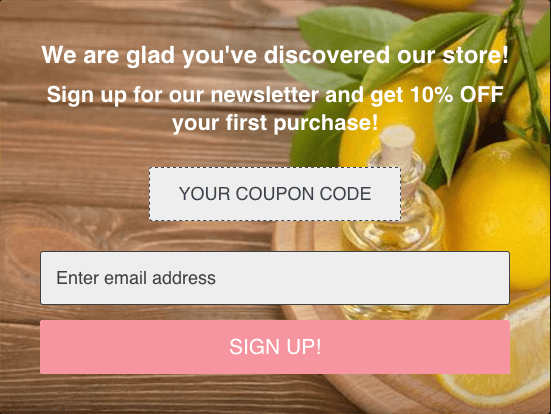 Before the Omnisend Email Lab experiment, Organic Aromas’ store had two types of sign up forms: a native Shopify signup form in the footer of the store and a Sumo.me bar at the top of the page. The subscription rate over the seven months (signups/website sessions*100%) previous to the experiment varied between 1.75% and 4.47%, with an average of 3.24%. The store was generating about 264 new leads every month. I would say that this is not bad for a small online store. However, this number could be way better. And this is how we did it. Without looking any further, we set up a Omnisend exit-intent pop up. This appears to the visitor when he/she tends to leave the site. Exit-intent technology is one of the most effective ways to retain customers once they have decided to abandon your website. Learn more about it and find great examples here. For the second week we chose to experiment with an immediate pop up. This shows up immediately after the visitor begins browsing in your store. This is a controversial pop up. Most people do not like it when something pops up on the screen before they’ve had a chance to see anything. However, this pop up showed stunning results! In one week it captured 135 new subscribers, and 10 of them ended up following through on purchases. A 6.8% conversion from one single pop up! What do you think about it now? For the third week of the Omnisend Email Lab, we chose a pop up that appears after a particular number of clicks. 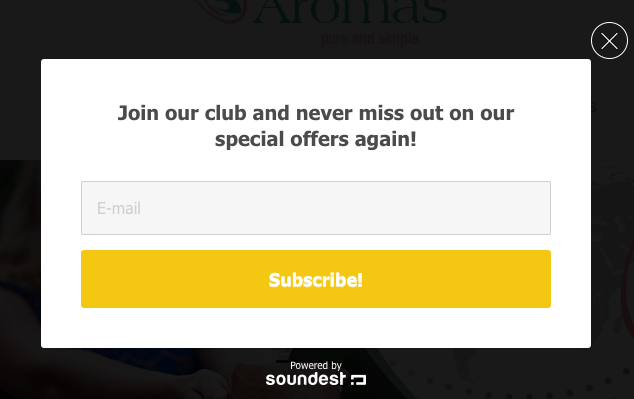 According to our experience, three clicks indicate that the visitor is engaged already and might be interested in subscribing to the newsletter. We used the same pop up design and copywriting as before, the only difference was the settings when the pop up has to appear. 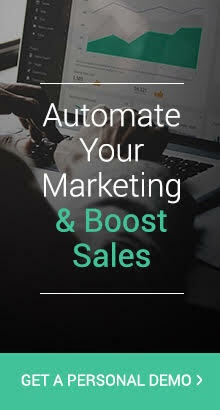 This pop up did not capture so many new signups as the immediate pop up, but it generated the biggest number of purchases – 17 extra orders in seven days. The last week was dedicated to the Signup Box. This is the least aggressive signup form and appears as a widget at the bottom of the page, inviting the visitor to sign up. 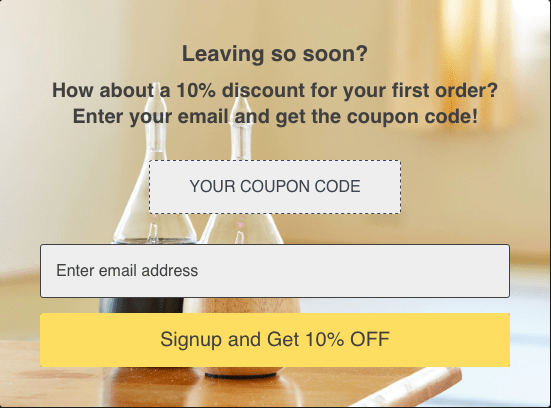 No discount code was offered for the signup. This signup page achieved only a 0.81% subscription rate in comparison to the 3.8% of the immediate pop up. Now that we know what the forms looked like, let’s dig deeper into the overall results. 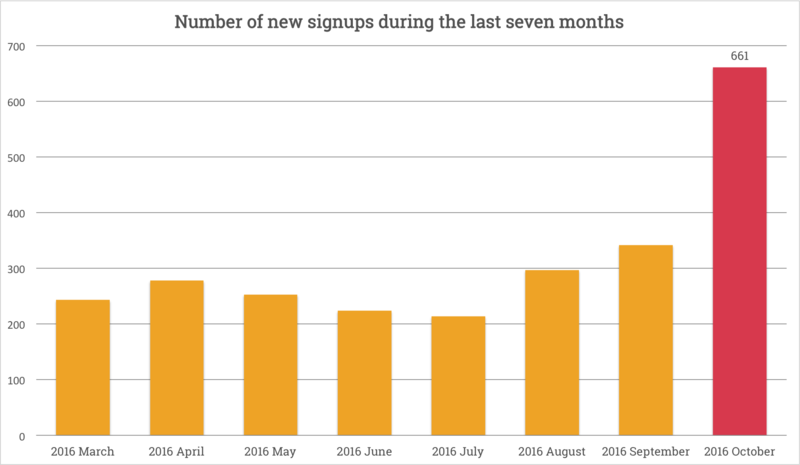 By adding extra signup forms and experimenting with them, Organic Aromas increased its new leads from 264 on average to 661. That’s an increase of 150%! 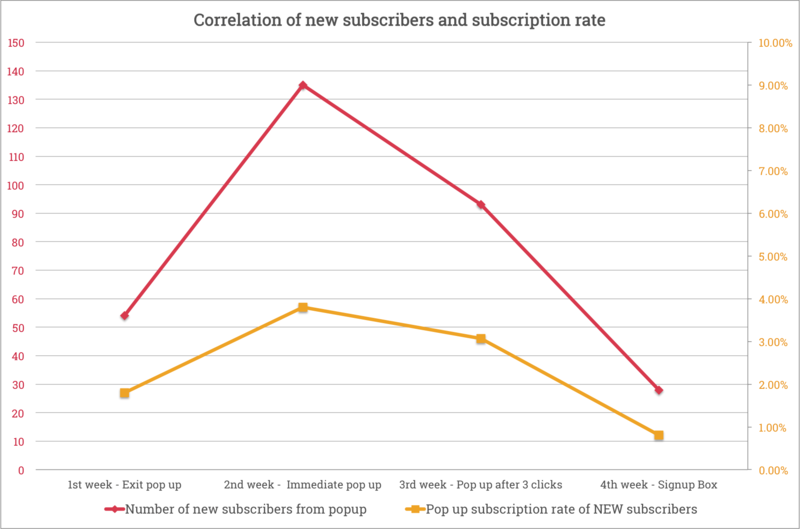 During the 2nd and 3rd weeks the number of new subscribers doubled just because of the pop ups. 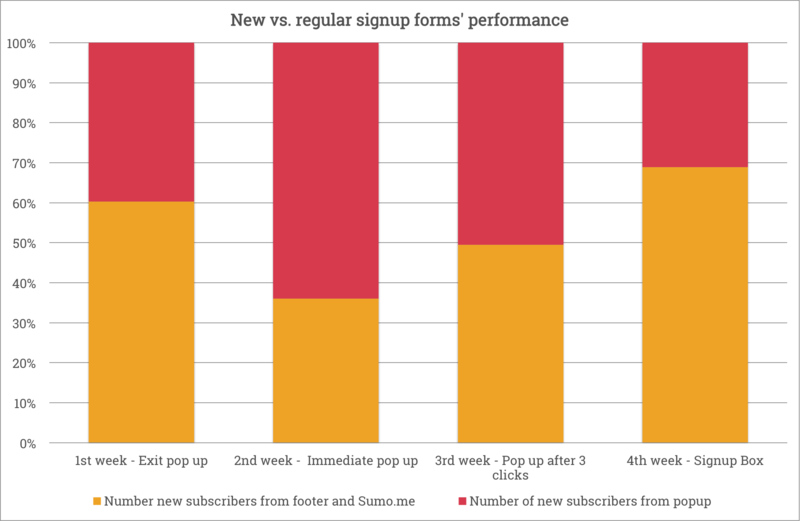 The chart below illustrates the ratio between regular signup forms and the newly added Omnisend pop ups. Immediately appearing pop ups generated the biggest number of new subscribers. By disregarding the fact that there was slightly more traffic that week, we also introduce the signup rate (signups/visitors*100). As you can see, it’s also the greatest – 3.80%. 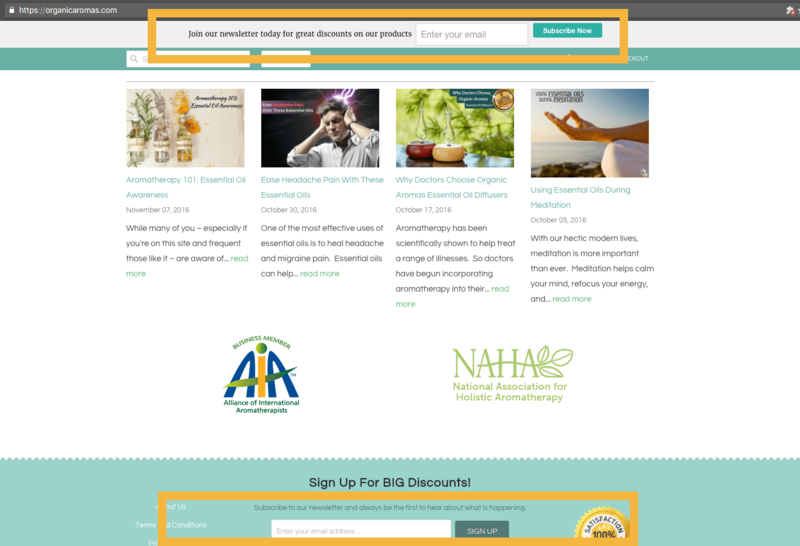 All signup forms, except for the last Signup Box, offered a 10% discount for purchases. 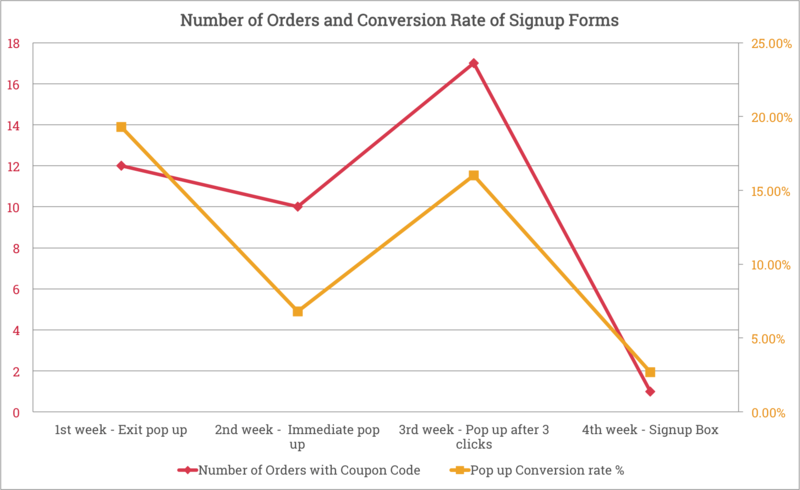 It was interesting to watch how the different types of pop ups influenced the conversion rate (purchases/new signups*100). It seems that the Exit pop up as well as the pop up that appears only to engaged visitors performed significantly better than the immediate pop up. So how is it possible that there is no single best pop up? It seems that you should use different ones depending on what you want to achieve: an aggressive immediate pop up for faster list building, or exit-intent and after-few-clicks pop ups to convince engaged visitors to purchase your products. The last week of the experiment showed that the Signup Box can be used along with the pop ups but shouldn’t totally replace them. The small widget can be kept all year long and be left alone to quietly do its work. However, a significant boost can be achieved using pop ups with discounts. The time invested in this experiment – only 15 minutes for each form -, means that only 60 minutes over the entire month were needed to obtain such great results. Last but not least, as a result of this experiment, you can have a deeper understanding about your own store and your visitors’ behavior. So, is it worth experimenting with your signup forms to find the one that works best for you? Good luck with your own experiments and don’t forget to signup to our newsletter – even more new Omnisend Email Lab cases are on their way! So stay tuned! Interesting! I found this content informative and helpful as per getting organic traffic for newsletters. Very well-researched and well written article! Great charts. Thank you, Karolina! However, I heard that after Jan.10th, 2017, Google is going to start penalizing sites that use pop-ups. So, even though it is the best at list-building, we won’t be able to use them anyway, unless we are okay with getting penalized. I think only the signup box will still be okay. Do you have any thoughts about this and what other options we have? Thank you, Norma for your comment. Indeed, Google is going to even more improve the browsing experience. The mobile-friendly stores with great reputation will have a priority in search results. At some point pop ups also have an impact on browsing experience, especially people find annoying those that do not have exit button. As you can see Soundest pop ups are not like this. However, we always follow the best practices, recommendations and try to reflect fast to changes. This time is not an exception, we will find the way how to improve pop ups so they could fit google well. Good article.. we have just completed a 4 week test ourselves using various popup offers. I think it is important to note that exit intent popups only show to desktop users so whilst effective… they miss a very large percentage of the site visitors who are on mobile. How did you get the figures to know how many of your subscribers actually went through with a purchase. I’m not aware of any metrics in Omnisend to gather that information. It would be good if it did. It would be also good to have design editing for popups to make them look better. At the moment they are pretty basic looking. Omnisend is a great program and easy to use so I really appreciate having it on our site. The BIG improvement it needs is integration with facebook audiences… so that we can create an audience based on products purchased or list subscribed to… and then market specifically to them. Klaviyo has this and is the reason we subscribed to them (too expensive) but I prefer using Omnisend.